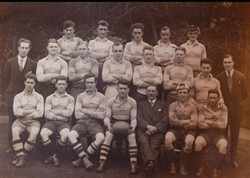 Olney RFC, black and white team line-up photograph season 1927-28, 50th season. Back row: F. Clare, C. Howard, A. Freeman, R. P. Lineham, A. Phillips (Hon. Treasurer). Middle row: S. F. Morgan (Chairman of Committee), C. H. Stanger, A. Sowman, R. G. Long, E. C. Plackett, R. A. Tompkins, A. Field, R. M. Sargent (Hon. Secretary). Front row: S. Dix, F. Millard, E. F. Robinson (Vice-Captain), R. Clifton (Captain), Dr. F. J. Grindon (President), J. Simcoe, J. Lovell. Photography Henry Cooper & Son. The County Studio, George Row, Northampton.